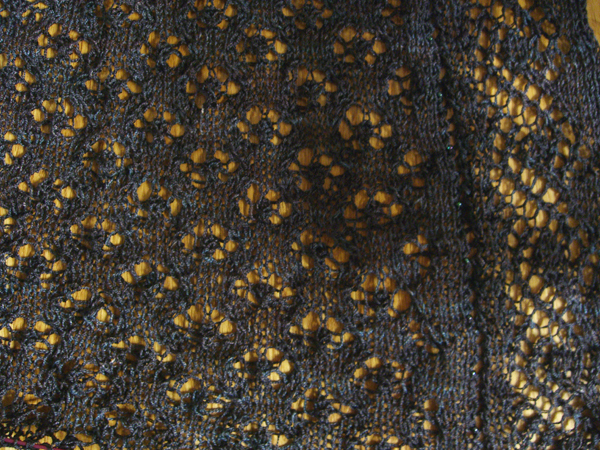 There hasn’t been a lot of knitting going on at chez PI this week — or at least not much that I can show you. You might notice from the right-hand sidebar countdown that Christmas is coming quickly! I do have a little bit of holiday knitting to complete. Hopefully it will be done today or tomorrow. I have knit a bit on The Wings Of A Dream. I have finished the first chart and I’m about 1/4 through the second chart. You will recall that this is Blue Moon Silk Thread in Thraven. I am knitting with a double strand, because this yarn is truly about the size of sewing thread. But, ohhhh…. gentle reader, this is very, very nice to knit with. Is there anything nicer than silk? I admit to being a total silkaholic. I wish there was some way to really show you the colors in the yarn. But it’s pre-dawn early so I’m stuck with artificial light. This was the best I could do. Sometimes it looks black, sometimes it looks blue. Love it, love it, love it! I still don’t have a decent art-shot of the PNW Shawl (aka The Great Green Glob). Every now and then, Mother Nature likes to remind us that we do, in fact, live in a rain forest. If you have been watching the news lately, you may have seen that we were sort of inundated here in the Pacific Northwest this weekend and early this week. We really had a lot of rain. A lot. I saw one reporter on the news who said, It must be a lot wetter than normal because even the natives are carrying umbrellas. 😆 I don’t know if you saw the video of the salmon swimming up I-5? That was interesting. I don’t ever recall I-5 being closed for so long because of flooding. It might not be open again until next week. Since that is the major route between Portland and Seattle, it’s kind of hard to get to there from here. But the trains are supposed to be running maybe today, so that will help. Chez PI weathered the storm with no problem, although I did lose my power for about 5 hours on Monday. But so many areas were just devastated. The clean-up is going to take years, I’m afraid. My heart goes out to those who have lost their homes and businesses as entire towns were drowned. Last Sunday, #1 Son braved the weather and came to my house to do laundry. But the really nice thing about his visit was he also kicked me out of the kitchen and cooked a really nice, spicy curry. Yum. He can do laundry any day if he’s going to cook, too! Although it may seem impossible when they are teenagers, strangely enough, our children do grow up. #1 Son also asked me if I’d knit him a scarf. He rarely asks me to knit anything for him. So a scarf will be on my needles very soon!